Designed by and built exclusively for TanningBeds4Less! This is for our most demanding customers, who want European style tanning but want the power of American style lamps. On both counts, the Shadow delivers. Introduced just two years ago, it is rapidly becoming the most popular Alpha Sun tanning bed, both for its raw power and striking looks. 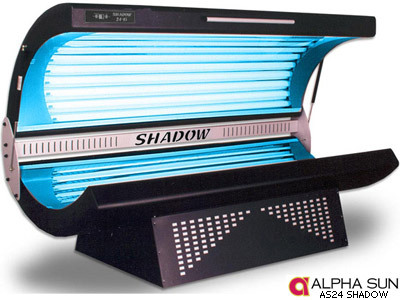 This Alpha Sun tanning bed is the only one to use the US designed "Shadow" lamp, that has over twice the UVB of the regular Sol Soft lamps, and delivers faster tans, with just a 15 minute tanning session. To futher boost performance, the Shadow comes standard with the XL parabolic reflector system. 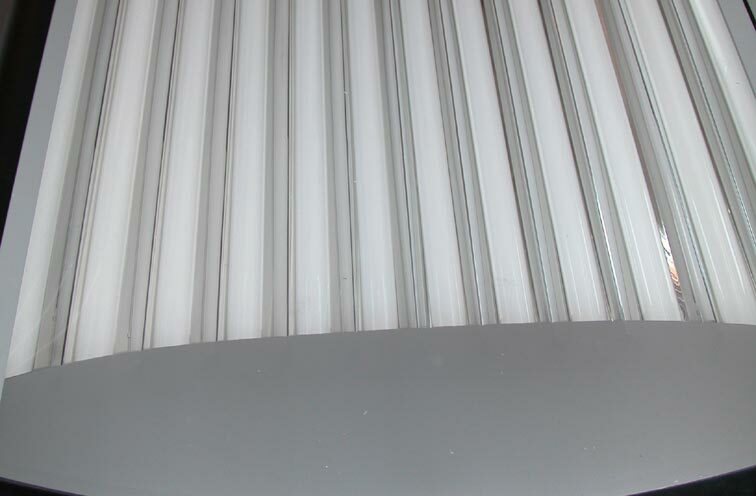 Rather than use flat, pan style reflectors like Wolff beds, the Shadow has one dedicated reflector system for each lamp, focusing all the UV to the tanner. You can see how there is a reflector inbetween EACH lamp, guaranteeing more UV is bounced back to you. It costs a little more, but combined with the stronger Shadow lamp, it is a big step up in performance. We also added some extra cosmedics such as the back reflector bar, special die cut pedestal design (that isn't a sticker, like cheaper beds would do) and metalic acrylic taping. It looks cool, but it's one hot tanning bed!